I’m a 21-year-old Creative Director of Wolfden Creative, a full-service digital agency based in the south of the UK. An entrepreneur and designer at heart, starting my first business at 19, and having had a huge interest in the design and marketing industry since an early age. Apparently since I was about 3, my favourite part of watching TV was the adverts..
I’m also a massive lover of minimalism and clean design. “Do what you love, and you’ll never work a day in your life”. If you follow me on Instagram, you probably know that my list of favourite quotes is not limited to those two. One year into running Wolfden Creative, the business began shifting a lot more into digital marketing, website development and social media, as opposed to just graphic design. This eventually led to a re-evaluation of our core offering. I knew I could no longer fulfil all of the tasks that our clients needed fulfilled. So I did what every entrepreneur should do sooner rather than later. I surrounded myself with people that were experts in certain elements of web, print and digital. That is the best, most effective, most efficient and fastest way to scale. The company is currently at 50+ clients in 24 months and growing rapidly. In late 2017, along with my co-founder and business partner Matt Pyke, we launched Pyke & Co, an e-commerce brand specialising in sleep improving eyewear. Pyke & Co focuses on the health & wellbeing of busy individuals through the importance of a good night’s rest. The e-commerce store at www.pykeandco.com offers Sleepwells Blue Light Blocking Glasses, which are designed to reduce the intake of artificial blue light emitted from mobile phones, TV’s and laptops. Matt and I created this company from our own pain points. We were bored of endlessly moaning to each other about how our sleep schedules are messed up, how our eyes hurt, and how we’re waking up with a headache most mornings. So we did what every true entrepreneur should do – we created a solution to our own problem. In early 2018, I started working alongside my second business partner, Lewis Raymond Taylor. Lewis is a great mindset coach, and the prime example of how to effectively market your personal brand online for people to hear you. Lewis specialises in coaching entrepreneurs and aspiring entrepreneurs, which often led to his mentees taking considerable action, and ended up being Wolfden Creative clients to kick-start their entrepreneurial dream online. That’s when we realised there’s a gap in the market – and we are just the right people to fill it. …that, and we recognised that a few people in the marketing space were doing things quite wrong, and we wanted to remedy that, and provide the people what they want, need and most importantly, what will actually bring them results. Our main TSM offering is a 12 week coaching and marketing programme, which takes coaches and consultants from 0 to hero. We use Lewis’ expertise in shifting the power of the mindset, and personal branding techniques that bring results, with my experience in branding, and building web / marketing solutions that convert. Together, we had The Ultimate Launch Package. I also like to do my bit for charity. That’s why I have one. Well, it’s not actually mine – but I am a board member of it. And a super proud one. Losing My Sight UK is a Portsmouth based non-profit which helps the visually impaired and blind of a working age to stay active, and pursue the joys of life after being diagnosed. My role at LMSUK is Media & PR management. What I bring to the table is the marketing, branding and communications expertise to make sure the charity has a voice in our community. 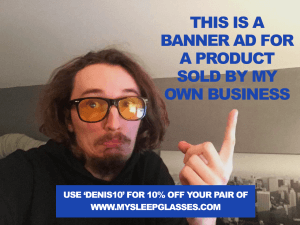 I love tying in all of the things that I believe in into one, which is why for every pair of Sleepwells Blue Light Blocking glasses we sell at Pyke & Co, we give £1 away to LMSUK.